The College Guidance Office provides information and guidance to assist students in creating post-secondary options that best suit each student's academic, social, and emotional needs. The goal is for all students to have several appropriate options for further education, either formal or alternative. The office is prepared to help students explore options including two- and four-year colleges as well as other non-traditional opportunities. During sophomore year, students begin to engage in all aspects of the college search process. Sophomores work with both their learning specialist and the director of college guidance to begin to identify post-secondary goals and potential colleges or universities that meet those goals. Students begin researching schools online and compiling a list of potential schools that fit their size, location, and academic needs. During January, parents are invited to attend a special college night presentation that identifies the procedures and process related to the college search and obtaining updated educational testing. In the second semester, the director of college guidance guest lectures in Metacognition classes on various college related topics including selecting appropriate colleges based on student interest, academic support in college, the importance of standardized testing, and the college admissions process. Overall, an individualized approach to the college search begins during this year with a specific focus on identifying post-secondary goals. At the beginning of junior year, the director of college guidance guest lectures in Metacognition classes on the timeline of the college admissions process. Additionally, students are afforded the opportunity to take the PSAT in October. Students are encouraged to make individualized appointments with the director of college guidance throughout the first semester to outline specific goals and tasks that relate to the college search process. During January, parents are invited to attend a special college night presentation that identifies the procedures and process related to the college search and obtaining updated educational testing. During the spring semester, students are enrolled in a college guidance course that meets once a cycle. The course is designed to assist students with the beginning of the college search process and assist with selecting appropriate colleges and universities based on individualized student needs and preferences. The course also covers a variety of college related topics including the Common Application, writing a college resume, community service, and major and career surveys. Families are also encouraged to make appointments with the director of college guidance in the spring semester to begin the college search and visit process. Overall, the students and families of the junior class are able to create, explore, and refine post-secondary educational plans in the supportive environment of Woodlynde School. On the first day of school, all seniors take part in a Mock Interview Day, where local college admissions representatives come to Woodlynde to review the admissions process and hold mock college interviews with students. There is a parent presentation on the third evening of school that overviews the college admissions timeline as well as other specific college factors that affect senior students. The College Guidance 12 course meets twice a cycle for the fall semester and primarily focuses on applying to colleges and universities. Once the majority of students are finished with the actual applications, the College Guidance 12 course focuses on a variety of topics that are pertinent to a student’s freshman year of college including time management, utilizing academic support services, scheduling classes, and identifying and choosing student activities. Families are encouraged to have open communication with the director of college guidance in order to best facilitate and manage applications and other post-secondary educational plans. The College Guidance 12 course concludes at the end of the fall semester, but students and families are encouraged and welcome to maintain contact with the director of college guidance throughout the year in order to finalize college plans. A College Handbook is provided to assist Woodlynde students and their parents as they research and formulate post-graduate plans. It includes information on college admissions, college planning timelines, and financial aid. College Guidance at Woodlynde does not end when a student graduates. Through our College Assistance Program, Woodlynde continues to provide guidance to graduates throughout the critical points of their freshman year of college. 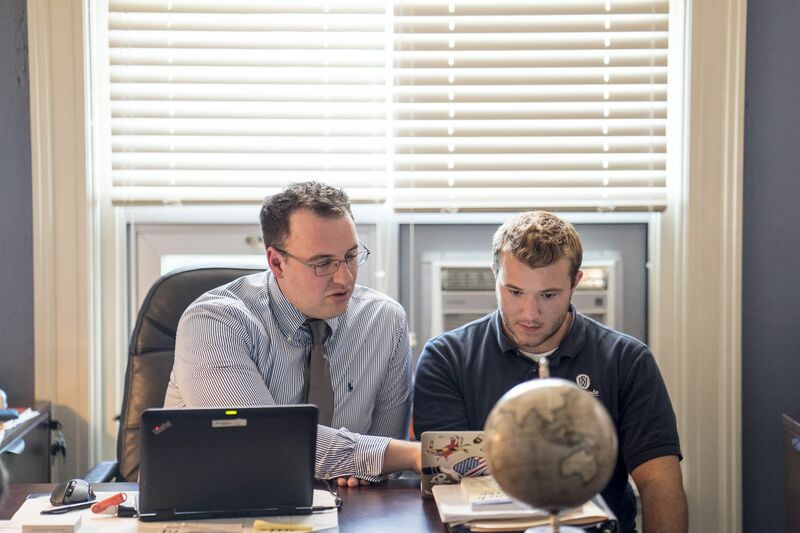 Each spring, our seniors pick a Woodlynde teacher to be their mentor. While mentors check in at regular times during the year, students are encouraged to be proactive and reach out independently for advice on academics, learning support, and even the occasional roommate conflict. Teachers provide an open line of communication as well as solid academic advice which allows students to navigate any potential situation during their freshman year.